The week has been filled with proud moments after moments! Our students have raised the bar in terms of standard and expectations in everything that they put their gifted minds to. Please read on for some interesting news from the Suchitra Campus…. Teaching preschoolers about stranger danger is very important in today’s times. The preschool teachers are doing this every month in a way that makes the kids aware and wary of strangers without making them overly fearful of every stranger they see. Instead , we teach them to identify and respond to threatening situations. Teachers also touch upon the topic of ‘Good Touch , Bad Touch’ informing kids about the dangers around without causing any anxiety in them. Machines are something that students are always exposed to and are always excited about. The theme began with a discussion on ‘What is a machine?’ What is the purpose of a machine? Kids came up with several examples of machines and how they serve the purpose of making our lives simpler. To make the learning more interactive, we had a display of simple machines on Monday , 2nd July where our kids could touch, feel and manipulate the machines. To make the learning of machines fun, we had a movie screening for our Pre-Primary kids to understand the working of machines. To learn the term ‘Change’ and ‘Machine’ better, the teachers on Friday, 6th July demonstrated how wheat turns to flour and flour to dough and dough to roti. Kids practically experienced the changes wheat goes through to turn into a roti. As we continue with our theme ‘Machines’ the Jr. & Sr. KG students were taken on a field trip to the carton box factory on Friday, 13th July. Kids were amazed to see the working of the machines at the factory. Pre-primary Parent Orientation was held on Thursday, 12th July. Parents were briefed about the school policies and a detailed explanation was given on the working of the Pre-primary. Phonic sounds and writing pattern of the alphabet, numbers and a few Math concepts were also touched upon through various demonstrations. Parents were also briefed on how the gradation works from Nursery to Sr. KG. Parents had few doubts and suggestions which were catered to during the Question and Answer session. The SPEAK TO LEAD CLUB held its first meeting of the year on Friday, 29th June. Paridhi Sarda of Grade XI was nominated as the President of the club. Declamation speeches, slam poetry, monologues were delivered in style by the students. a platform where students learn to resolve conflicts by maintaining peace and harmony. It helps to hone their skills of diplomacy and emerge as leaders. Students filled up the registration forms and chose the committee they would want to be a part of. The battle ground is ready, but they need to know the hows and whys of the conduct of the MUN, hence the teachers have started to train them. And now we are waiting for the best delegates to emerge who will represent the school in the inter-school conference. An ORIENTATION SESSION FOR NEW PARENTS was conducted on Saturday, 30thJune. This meeting highlighted the mutual expectations to be shared and provided a better understanding of our teaching and learning process. The parents got an overview of the schedule, some practices and specifics that are unique to Suchitra. 3rd -5th July was a very busy week with a plethora of Intra-school competitions celebrating the English Language Week. Tuesday, 3rdJuly, was the day of RECITATION, SPIN-A-YARN and WHAT’S THE GOOD WORD? The students of Grades I-VII taxed their imagination to think off their feet. The poise and comfort with which they recited the poems and the prioritization and sequencing of thoughts to display logical thinking by our budding story tellers, the joy of guessing the right word or idiom was appreciated by the audience and the judges, Mrs. Manjula Reddy, an acclaimed poet and Ms. Kunisha Reddy, student of Literature. Wednesday, 4thJuly, the second day of the Language week included SHOW AND TELL by the students of Grades I – II followed by a captivating session – FLIGHT OF STARS where characters from books were brought alive by the participants dressed as the same, delivering first person accounts of their lives. The Founder- Director, Mrs. Sonal Andrews of the Integrated Preschool Teachers Training Academy was impressed by the talent exhibited by the students. And then came our budding actors-who picked up arresting dialogues from movies and threw themselves wholeheartedly into the enactment of the same- in THE LEGEND SPEAKS ! Thursday, 5th July, was the day of CREATIVE WRITING AND POETRY WRITING COMPETITION for Grades I-VII. Students wrote poems and narratives on interesting topics like ‘What’s under my bed?’, ‘The Dreams I Have’, ‘A city where everyone smiled! – to name a few. This highlighted our students’ power of expression and imagination. 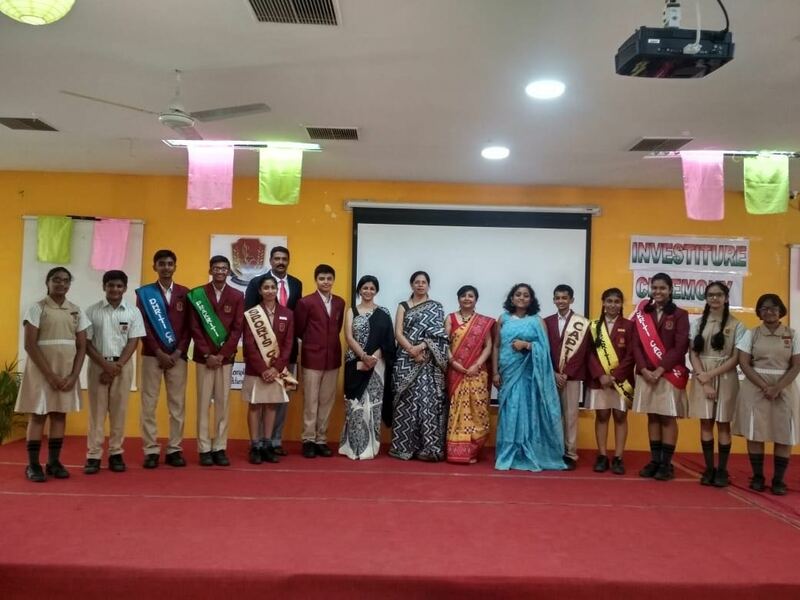 Talentime, the annual event to encourage the love of words, an Inter school literary event/ competition, was celebrated on Tuesday, 10th July– a culmination of two weeks of strenuous rounds of eliminations in class, semi-finals and the intra-school finale. 14 schools from all over Hyderabad participated in this event, making it a grand success. MrsBaljeet Kaur, Mrs Urmila Mahajan, Mrs. Jayashree Sanghani, Mrs. Alice Mathew, Mrs. Lakshmi Siddamsetty and Mrs Ekta Lilani, renowned names in the teaching field, were the chief guests for the day and our honorable judges. This year with new competitions added to existing ones- like SPIN-A-YARN, WHAT’S THE GOOD WORD?, SHOW AND TELL, FLIGHT OF STARS AND THE LEGEND SPEAKS made the event even more interesting and equally exciting. The poise and comfort with which the participants spoke was appreciated by all. The students of Grade X B presented their special assembly on the topic WATER AND ITS ORIGIN on Wednesday, 4th July. They spoke about the origin of water, its composition and how we humans depend on it for our existence. The presentation ended on a thought provoking note where the students highlighted the facts about water pollution and the dire need to save and conserve water. Water, one of the most important components of life on Earth, has been the reason for transforming the unruly human race to a civilized organized species who have become the rulers of the world. The special assembly presentation by the students of Grade VIII B on Wednesday, 11th July, explored the facts behind the BIRTH OF CIVILIZATIONS. Students established the fact that without water, no civilization could exist, not even with our super advanced technology. The assembly concluded with the students imploring all to do their bit to save rivers and water. SPECIAL ACTIVITY: UNLOCK YOUR POTENTIAL ! 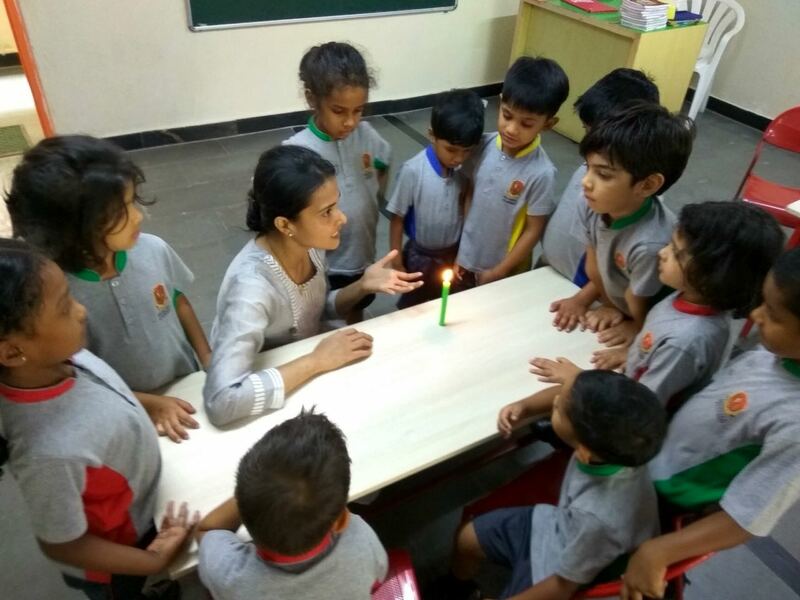 On Thursday, 12th July as a special activity titled TAKE UP A CHALLENGE, students from Grades I- III were given a few interesting activities- activities that provided a challenge and developed the child’s creativity, imagination, thinking skills and social skills. Children rose to the challenges offered and had a gala time working as a team. Squeals of delight and laughter reverberated in the building bringing involuntary smiles to the faces of the teachers! Students of Grade V are learning about Skeletal System. To enrich their knowledge Dr. Raghu, a Physiotherapist was invited on 12th July, 2018. He spoke about different types of joints, first aid given to an injured person. To make the talk interesting , he also came ready with, different joints ,x-rays and chart. HEALTH SAFETY, ENVIRONMENT AND QUALITY (HSEQ) MANAGEMENT SYSTEM. The past fortnight has been unbelievably busy and challenging. As per our policy of NCLB (no child left behind) all children got the opportunity to compete for the events planned for the Language week. Wherever there was a tie, another opportunity was given to excel. Endless planning went into executing this systematically and the English Department teachers along with so many other supporting teachers were on their toes ! The culmination was by way of TALENTIME – Our annual Inter-school Literary competition. 14 schools, 150 participants and multiple activities ! It was an extravaganza! We are also heading into another flurry of preparation and competition with our maiden SUCHITRA MUN, for which we expect another benchmark set and another level hit. It is this quest for reaching new milestones and providing world-exposure to our students, that keeps us charged and ready to meet new challenges head on! 4. SATWEEK VII THIRD S6 PALLAVI MODEL SCHOOL, BOWENPALLY. We are happy to keep you informed about the various events and happenings at Suchitra!! Please read on how the fortnight unfolded at Suchitra Campus…. Change is the only constant in this world and nothing else is. In our everyday life, we observe so many changes around us—of night turning into day, of our piping hot breakfast turning cold before we consume it, of fresh flowers in the morning drooping by evening. While these are more immediate changes, there are also changes that take place over a period of time. To teach this omnipresent topic, teachers used the inductive method of teaching. 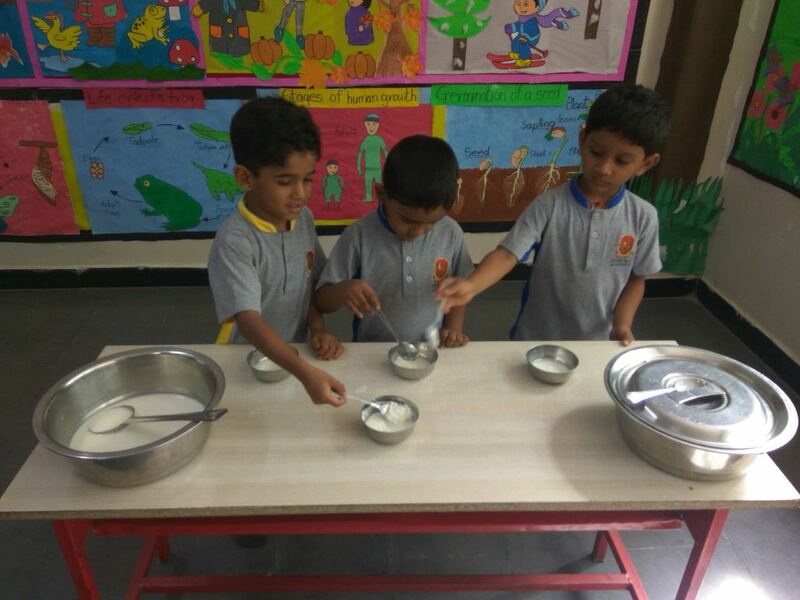 It truly has been exhilarating for the kids to learn different types of changes through various activities which, we are sure have triggered multi-dimensional learning in children. Different types of changes like fast change, slow change, permanent change, desirable, undesirable change, etc. were explained through beautiful illustrations such as sharpening a pencil, curdling of milk, burning paper to ash. These activities were done throughout the week to make children aware of how the changes take place around them. 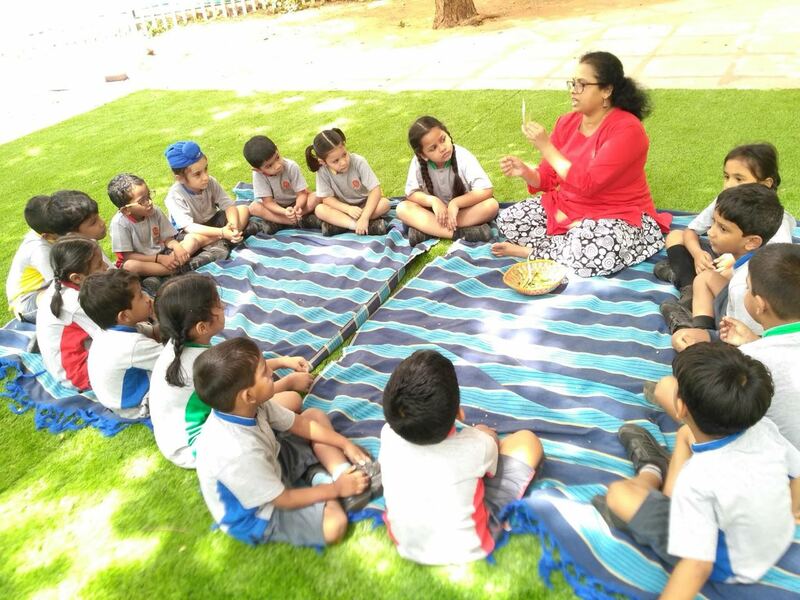 To make children understand the life cycle of a butterfly, the Pre-primary teachers enacted the story ‘Charlie, the caterpillar’ on Wednesday, 20th June. This story helped children understand and tell the various stages of the life cycle of a butterfly. 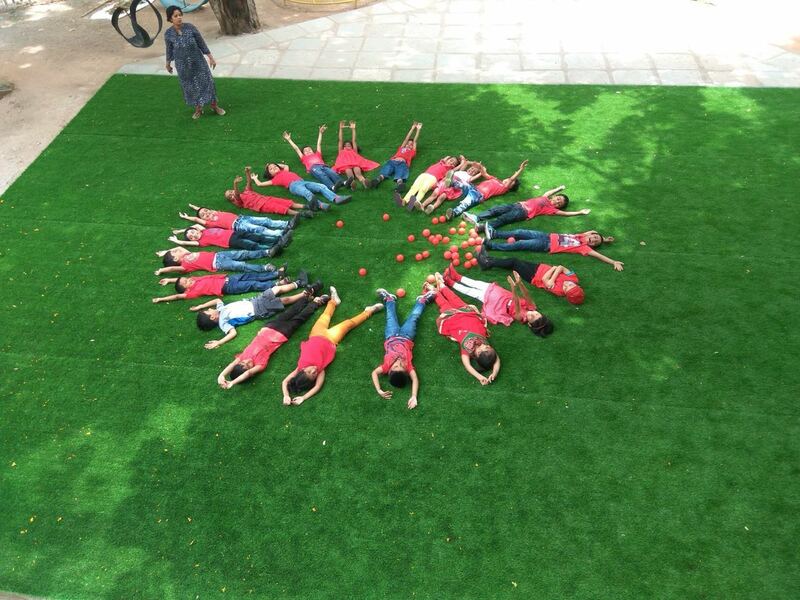 red and spent a spectacular fun filled day playing various red colour games. It was indeed a wonderful learning experience for the children. 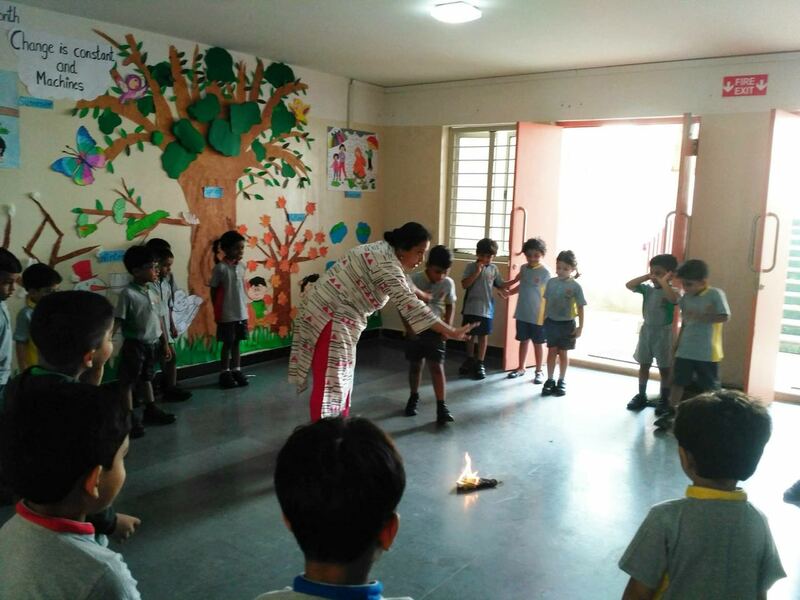 On Tuesday, 26th June, the Pre- Primary teachers introduced the water cycle through a skit on the story ‘The life of water-Water which gives life’. Children were shown how the tiny drops go up and form clouds and then fall in the form of rain. They were also taught about the importance and the uses of water. On Wednesday, 27th June, children were encouraged to sow seeds. Children had brought pots that they painted and sowed the seeds in them. 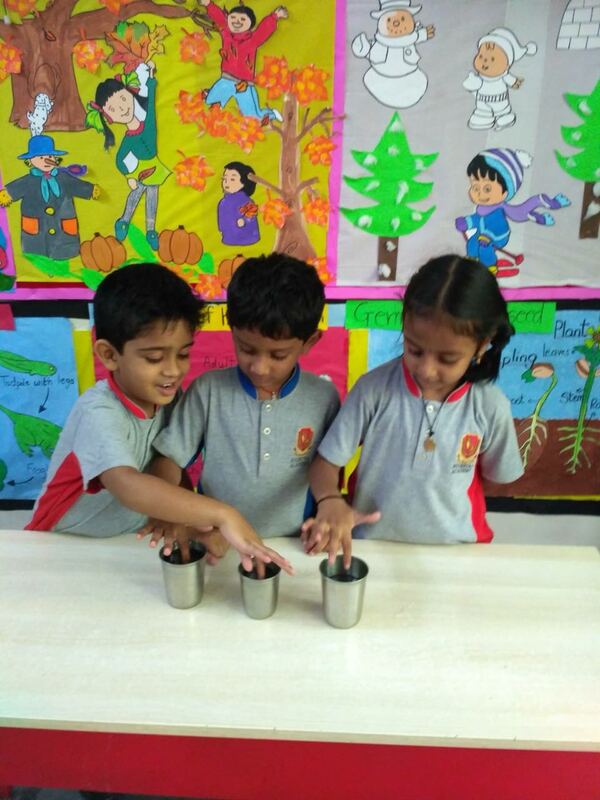 Children will soon learn that the plants need soil, sunlight, air and water to grow. They were also taught the importance of taking care of them and to observe their growth. Friday, 6th July : Demonstration on turning wheat to flour, flour to roti. “My best friend is the one who brings out the best in me.” – Henry Ford. On Friday, 22nd June, the students of Grade III D presented a special assembly on the topic OF ALL POSSESSIONS, FRIENDS ARE PRECIOUS. The assembly focused on how friends play a huge role in our lives in shaping us into the person we are. The students enthralled the audience with their melodious singing and a foot tapping dance number. They learnt that loving relationships are integral for our well-being and survival. addressed the gathering and complimented the school on its various brilliant policies. We are grateful to Mr and Mrs. Toshniwal. impressive layouts and content for their respective constitutions and enjoyed the project as well as acquired quite a chunk of knowledge through this innovative assignment. every child is given an opportunity to speak in front of an audience. event or being such an integral part of the World Music Festival that we celebrated in school. It seems unbelievable that they have been here barely for a month! Beatles, Queen and Linkin Park along with a couple of Hindi dance numbers. Three Cheers for their initiative and Wishing them many more such opportunities! Students from Grade III were given a homework assignment in April to begin composting in a small pot. They brought/bought the compost and went around the campus to put it around the trees and plants. As part of their topic on Community Helpers, students from Grade II went and spoke to the drivers and maids in the school about their childhood and what they like to do. 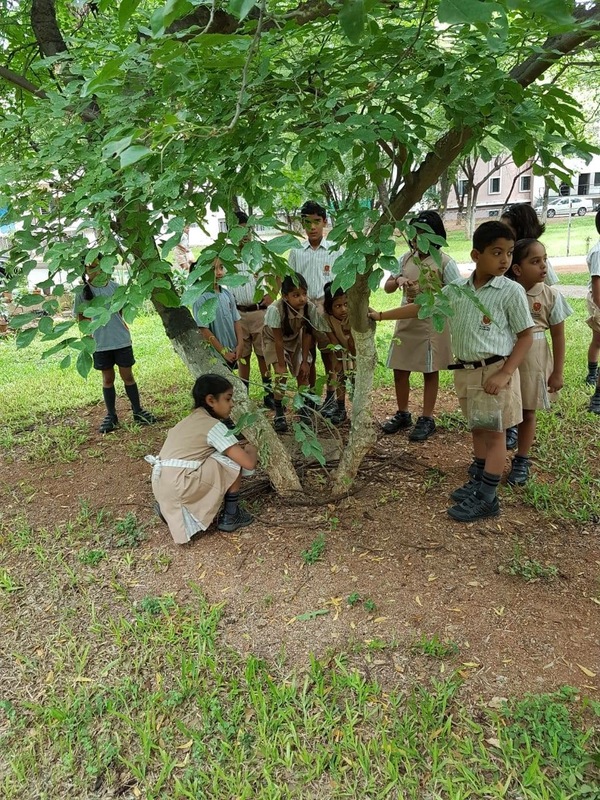 Students from Grade V became data scientists for a day when they collected data regarding number of trees in the school. They found out the names of trees, type of reproduction, flowering time and uses were plotted on the bar graphs. Grade VIII had a session on making a robotic arm from material used everyday as part of the Artificial Intelligence program. The students were all excited and got actively involved in the process. Congratulations to our Achievers !! Asian U 14 championship – held at Pune : Winner – Doubles ; Runner Up : Singles. Eshita Raju has won a silver medal in the Mangolia Junior International series of Badminton. Dear parents I sincerely hope that having the App for bus tracking has brought some relief to all of you. Those students and parents who joined us this June- hope everything is fine and the children have settled in well. For any issues please write in to support@suchitra.in. Contributions : Deepa.K, Anne.I, Satya.S, Sujana.L,, Sirisha.S.